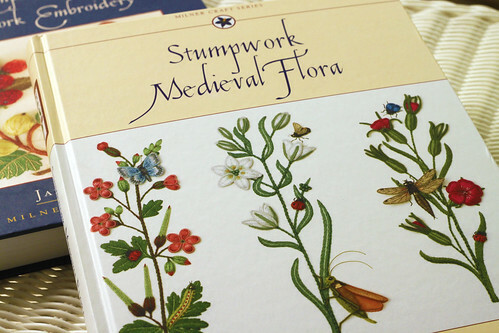 I have had Jane Nicolas’ new book, “Stumpwork Medieval Flora”, on pre-order at Amazon for months. It finally came in today’s mail. The embroidery is gorgeous! 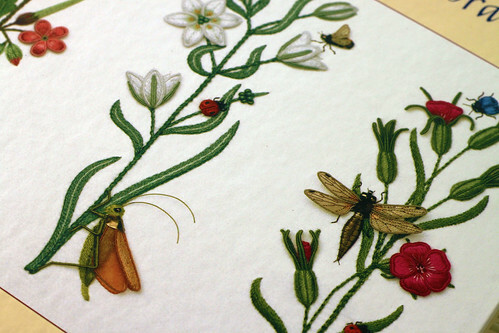 I do not think anyone embroiderers insects as nicely as Ms. Nicholas does. I have too many irons in the fire at present to start one of these designs. I wouldn’t even know which one to pick. After I finish up some sewing, and finish my sock knitting, maybe I can start embroidering again. I guess I could always stop blogging. This entry was posted on Wednesday, September 2nd, 2009 at 3:00 am and is filed under Embroidery. Tagged: Embroidery, Stumpwork. You can feed this entry. You can leave a response, or trackback from your own site. It all looks so three dimensional! The bugs look almost real in your photo. I love Jane Nicholas’s work. She hasn’t had a new book out for years. Thanks for alerting me to this one. One for my Xmas list, I think. Beautiful images of Jane’s work. I have just done three years of masterclasses with Jane for the medieval panels and it was the highlight of my embroidery life. Jane’s work inspired me to write two fantasy fiction books in which the heroine is an embroiderer who creates a mysterious stumpwork robe. Jane gave me much technical advice in the process, so that Adelina’s actions were as true to type as possible.